I do enjoy keeping a sketchbook journal for fun. It’s actually one of my favorite past-times! Over the years, I've kept several different categories going in various brands of sketchbooks, each brand having their various qualities that I like. 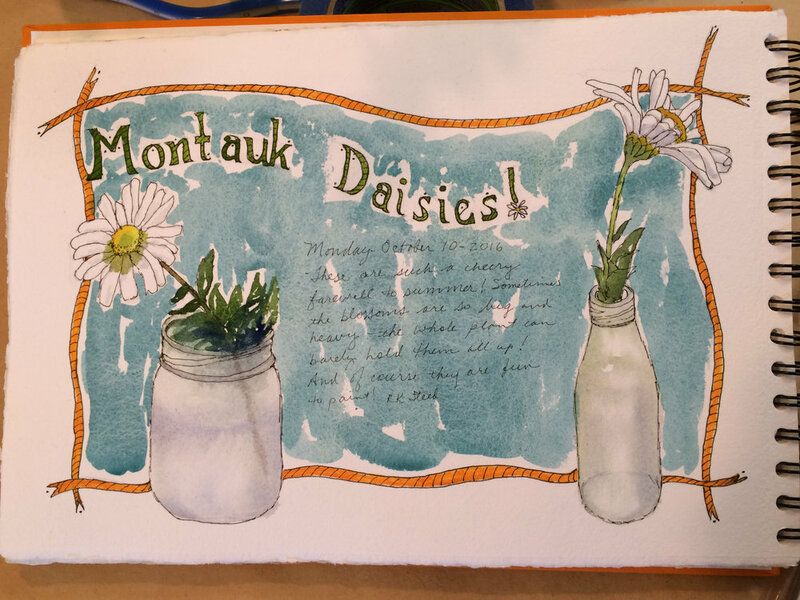 For travel, when I want to keep things really light, I take along a Moleskine watercolor book. It handles sketches, and washes and ink just fine. I love traveling - and teaching when I travel each summer. This year (2019) I’ve got 2 workshops filled in France. Stay tuned for 2020, Italy perhaps? You wont’t want to miss the next one! Sketching, to me, is a bit like thinking on paper - gathering memories (sometimes as quickly as possible) and playing with color and design, remembering the fun of that one particular moment of a day. Sketching, to me, is NOT a botanical rendering, or an architectural rendering. While those things are beautiful in their own regard, they are NOT what I've come to do. What I do LOVE about sketching, is that it is gathering the joy of that day...within the moment, usually out in nature, or the bits and pieces gathered from nature. The nicest thing is that later, returning to those pages, always triggers memories, and brings a smile to my face each time. 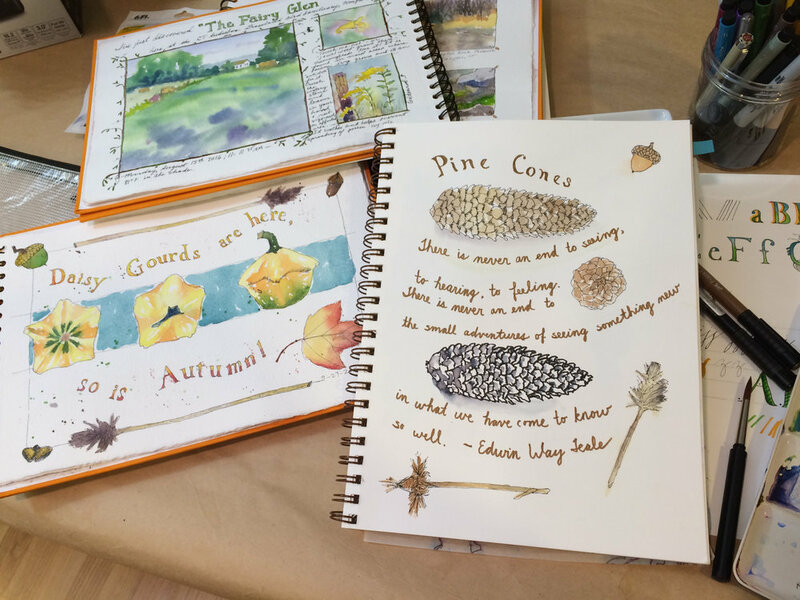 Perhaps you'd love to create your own travel journal during a fun fascinating retreat. Explore a bit of the towns and countryside of Southwest France in June 2019 with us! We'll be making memories to last a lifetime! These 2 workshops are filled - but stay tuned for 2020 announcements! Garzapapel Sketchbooks (from Spain) left, and on the right, a 9x12 Strathmore Visual Journal with paper suitable for mixed media. Perhaps you'd love to join one of my local classes in person, here in my studio in Mystic, CT. 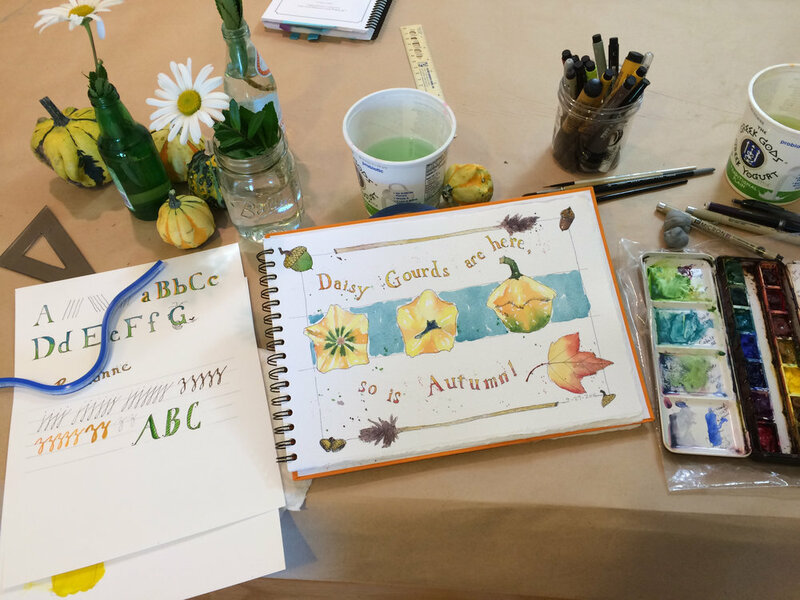 Learn the 'secret to watercolor' and all the ways you can use this fun, accessible medium, and make sketchbook painting a part of your life! 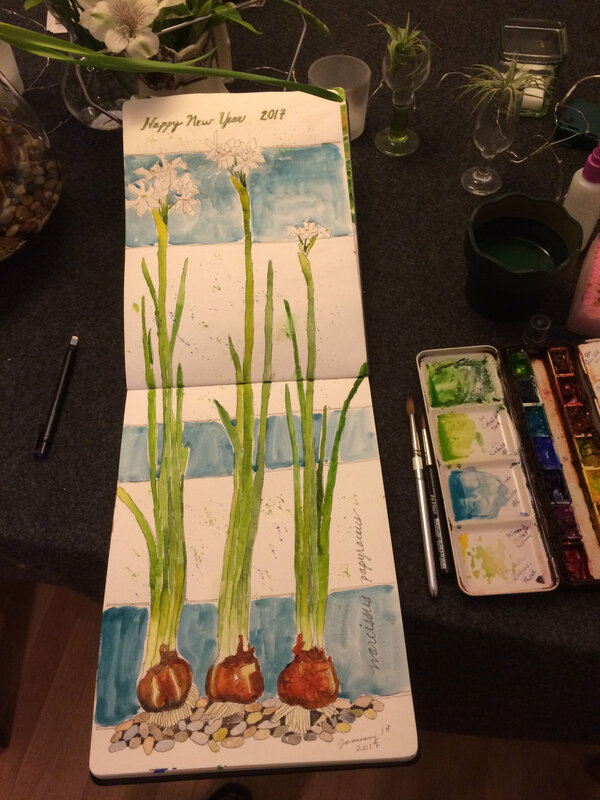 This sketchbook is a Stillman & Birn book with hotpress watercolor paper - a very smooth surface. Sometimes I'll bring along a little sketchbook that I can gather family activities and everyday stuff in. This one is a bound Stillman & Birn with hot press/smooth finish paper. The smooth finish allows me to use various pens and inks much easier than a 'toothier' paper, and I like to make memorable notes about the day as well. Such as our Thanksgiving meal prep (above) and post turkey naps (see gallery pics below). 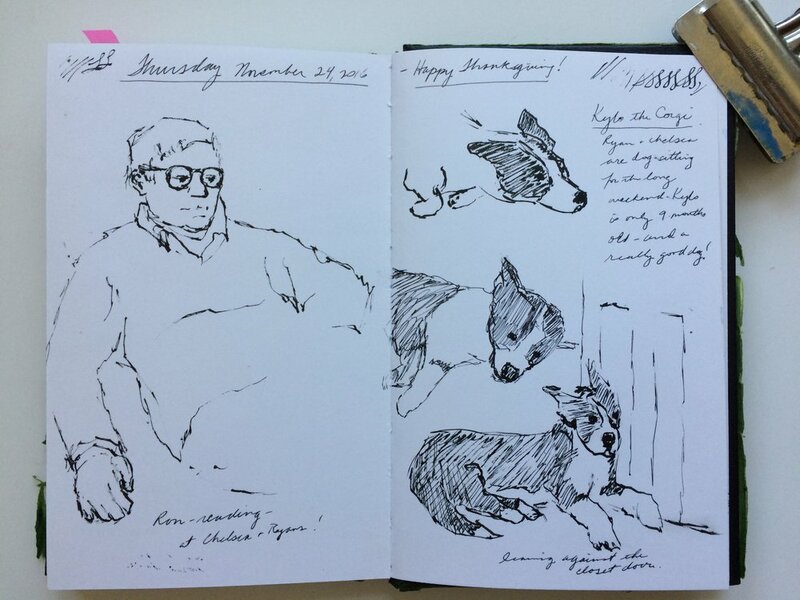 Another sketchbook that is inexpensive and good to try out all kinds of ideas on is the Strathmore Visual Journal. Mine is 9x12" and allows for lots of room to try out new ideas. Another journal (you'll find in the gallery below) I keep strictly as a "garden journal". I use it as a log of what's growing each season through the years. This particular one is made by Nujabi, with handmade paper from India. The surface is soft, almost cloth-like; and holds washes well, though heavy inks and markers tend to bleed through. It won't take much erasing, but the washes can be quite delightful! It's a wonderful record of the progress of our garden. It's a 'gratitude minder' of sorts for the incredible work my hubby and I have put into our surroundings, making our home a beautiful, loving environment to spend our free time. So, no matter what kind of sketchbook you choose to keep, I do hope you'll consider the fun. It's a very personal form of art-making, just for your own delight...unless of course, you choose to share it! You'll notice growth in your efforts over the years. And I do think the memories you'll keep for yourself, will be joy filled! Are you hearing the call of art-making, but not sure where to begin? Would you like some personal instruction to get you started, build your confidence so you can join in on a group class soon? Perhaps you'd like private lessons - I can get you "up to speed".